The route is set in the 1930s when the route was operated by the Colorado and Southern. The route features that portion of the 3 foot gauge line starting in Golden, Colorado around 15 miles west of Denver and heads west through Clear Creek Canyon. About 12 miles west of Golden the line splits at Forks Creek. 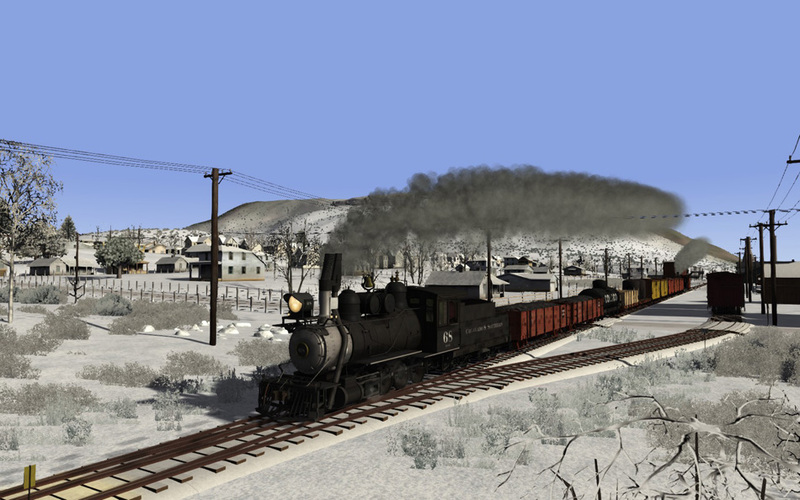 The branch to the mining towns of Black Hawk and Central City goes off to the north and the mainline continues west. On the branch, the line has a double 'switch back' to gain elevation between Black Hawk and Central City. The mainline passes through Idaho Springs about 8 miles west of Forks Creek where they are many rail served mines. West of Idaho Springs the line continues to follow Clear Creek to Georgetown. At Georgetown the steep ascent on 3.5% grades starts to Silver Plume around the famous Georgetown Loop where the line does a loop over the top of itself and a double horseshoe before arriving at Silver Plume. The route starts on the dual gauge trackage at Golden roughly 15 miles from Denver. Golden at one time had a large roundhouse for the Colorado Central but in early C&S days all the locomotive facilities for the Clear Creek division moved to Denver. Golden once had a large brick works but is more famous for the location of the Coors brewery. Leaving Golden, the line enters Clear Creek Canyon and starts climbing on grades of up to 4.2% (1in23) passing through Crusher where the dual gauge ends then on to Magpie, Chimney Gulch and Huntsman. Then it crosses Clear Creek for the first time just before the siding of Guy Gulch. The line then passes through a narrow canyon at Inspiration Point and comes to Beaver Brook. Here a pavilion was built on the canyon side for passengers to stretch their legs and admire the view. In the early days of the railroad Beaver Brook was a water stop, however this was moved to Elk Creek by the era the route is set in. Beaver Brook had a siding for loading lumber and a depot which also served refreshments to passengers. From Beaver Brook the railroad follows Clear Creek through many bends in the twisting canyon and crosses back to the north side of Clear Creek just before coming to Elk Creek. Elk Creek is the first water stop out of Golden. Elk Creek has a long passing siding and the grade flattens out here but some sections still have a maximum grade of 3.5% (1in28). From Elk Creek the railroad passes the sidings of Roscoe and Big Hill before coming to Forks Creek. Forks Creek has a depot and passenger trains stopped here for passengers to get refreshments. Forks Creek has both a coaling dock and a water tower as well as a Wye to turn locomotives. At Forks Creek the line splits with the mainline going to Georgetown and a branch line heading to Black Hawk and Cripple Creek. West of Forks Creek the mainline continues westwards in the bottom of Clear Creek Canyon coming to Floyd Hill where the road US6 starts to follow the railroad again for the first time since Golden. Now from Floyd Hill Interstate 70 also follows Clear Creek which has dramatically changed the area. On the approach to Idaho Springs the line passes the distinctive and unusual Argo Mine. The mine tunnel here as well as being a mine also connected with mining tunnels in the Black Hawk and Central City area and helped to drain those mines. The large red Argo Mill Building still stands today and is a museum. The large wooden railway loadout was not so fortunate and collapsed a few decades after the railway was closed. 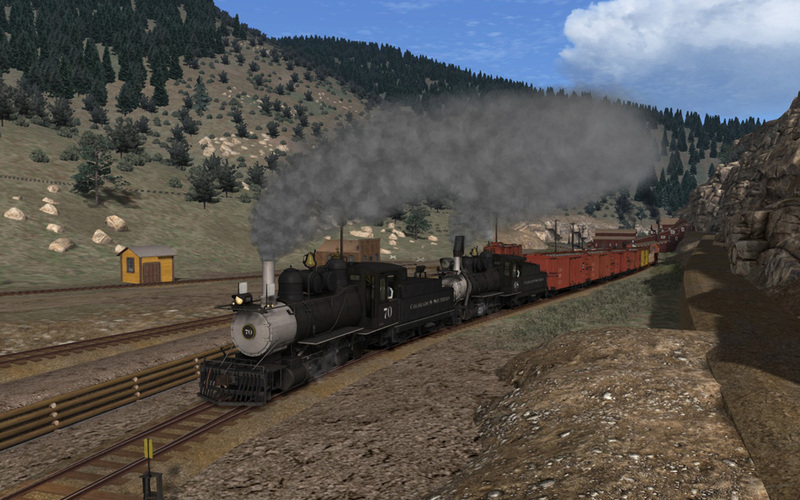 Idaho Springs is the biggest town west of Golden on the railway and had many rail served industries with sidings or spurs as well as a depot and a small yard. On the western edge of Idaho Springs there is a water tank, the last before Georgetown. Idaho Springs never had a wye or turntable so it was never possible to turn a loco at Idaho Springs. 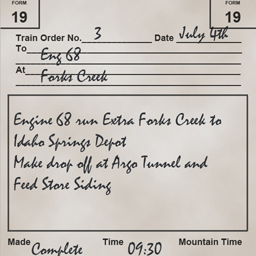 From 1938, when the line west of Idaho Springs was abandoned, to 1941 tender first running was required in one direction between Idaho Springs and Forks Creek. West of Idaho Springs the Clear Creek valley becomes more open and there were many mines and mills with rail access. The first is the Maud Monroe. 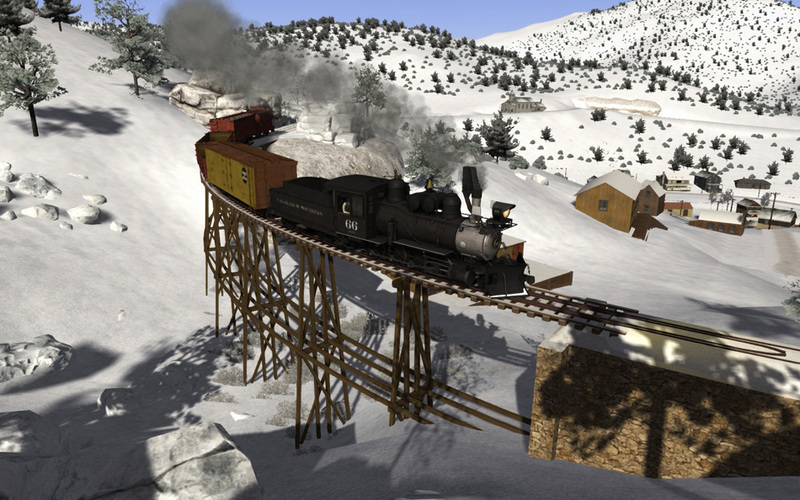 The line then crosses Clear Creek on a wooden girder bridge where a spur from the Stanley Mine joins the mainline. The distinctive yellow building is still there today although long abandoned. Continuing westwards the line comes to the small town of Dumont and then crosses Clear Creek again before coming to the small town of Lawson. Continuing west, the railway comes to the town of Empire Junction. The town of Empire was a mile and a half away by road. Empire Junction was simply just known as Empire to the railway. From Empire Junction the railway turns to head south to Georgetown. Around half way between Empire and Georgetown the railway passes a siding for St Georges mine. Arriving in the Georgetown area, the railway passes Georgetown Lake before crossing Clear Creek a couple more times and before reaching the Georgetown Wye. The line splits just beyond the Georgetown water tank. The line straight ahead goes to the main depot and some warehouses while the main line curves off to the east and starts the climb up to Silver Plume. Above the town of Georgetown the grades increase to 3.8% (1in26) at several points. There are spurs for several mines and one to the Georgetown Power Station. The railroad now enters the famous Georgetown Loop. The line then completes a circle by over itself 100 feet higher on the Devils Gate High Bridge. The line continues to gain elevation using 180 degree horseshoe curves to finally reach Silver Plume. Silver Plume has a small yard and depot in the town. Beyond the Silver Plume depot the line comes to a wye where a clock tower and pavilion built for tourist excursion trains to the Georgetown Loop. The line finally terminates at Terrible Dunderburg Mine. At the one time the line went on to Bakerville. 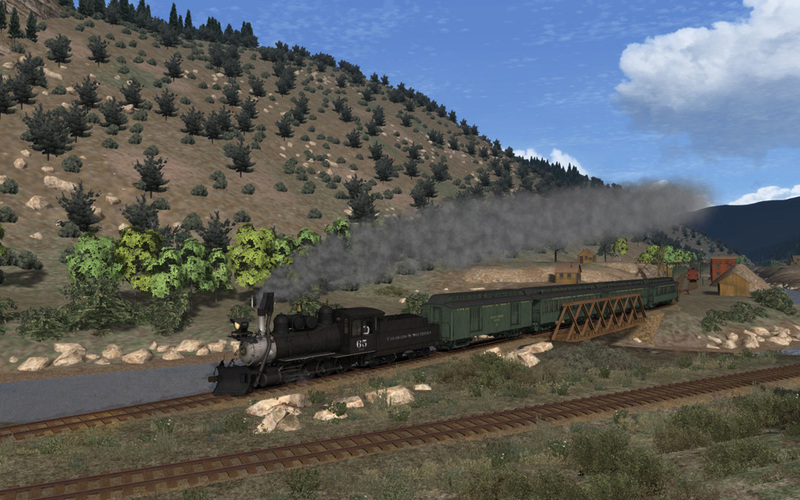 The Black Hawk branch leaves the mainline at Forks Creek and climbs on grades of up to 4% (1in25) up the North Clear Creek Valley to Black Hawk passing sidings at Cottonwood before coming to Smith Hill where there is a water tank for the thirsty locos climbing the steep grade. The town of Black Hawk is situated in the bottom of the North Clear Creek Valley. Arriving in Black Hawk the line passes the Iron City Mill and the very large Penn Mill at the lower end of town. As well as being served by the C&S at one time all the mills and mines in the area were also served by the 2 foot gauge Gilpin Tramway which was abandoned by 1920. The railway then crosses the North Clear Creek and passes the Randolph Mill and a few smaller mills or mines before coming to a turntable nearthe Black Hawk water tank. 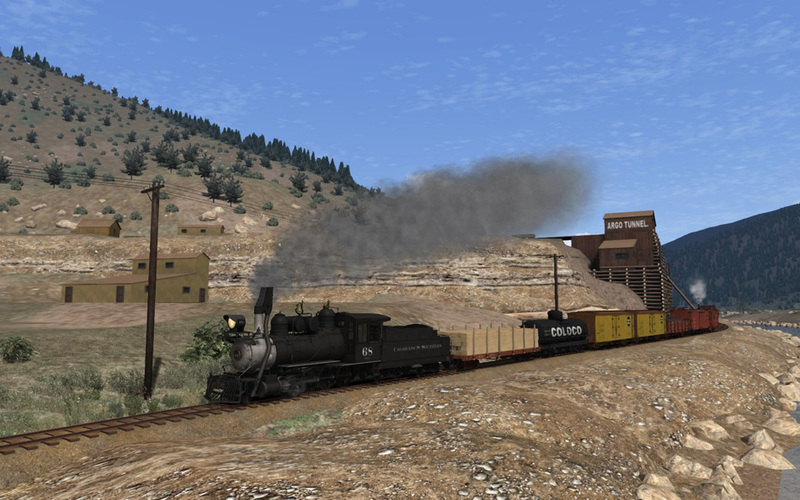 After passing the water tank, the line crosses the North Clear Creek again and climbs to the main depot and yard in Black Hawk. The line continues past the large Bob Tail Mill which has rail access at both the lower and upper sides of the complex. The railway reaches the lower switchback where all trains have to reverse to continue the climb up to Central City. On the switchback, the line passes the Bob Tail Mill where it can service the mineâ?Ts upper spurs. It then crosses the main street in Black Hawk on a high overbridge. The line comes to the Running Lode Mine siding before crossing a large wooden trestle on the final climb up to the upper switch back. At the upper switch back all trains reverse again and continue in the direction of Central City. 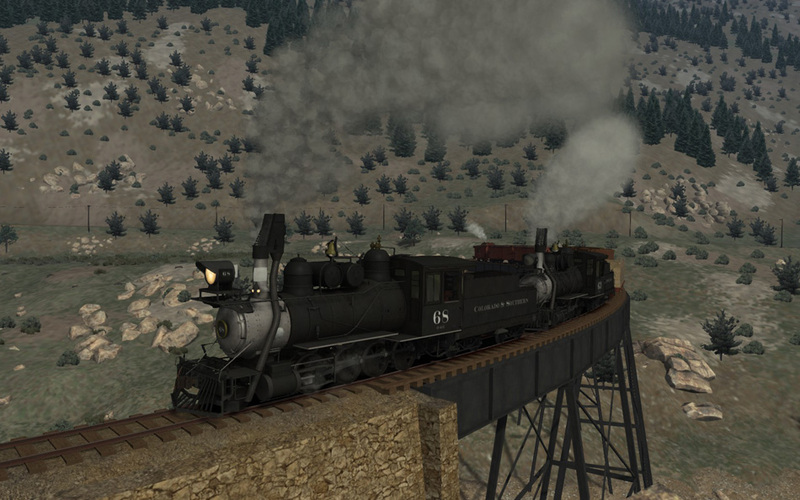 After passing back past Black Hawk (now 300 feet below) the line goes over the Mountain City trestle and reaches Central City. Central City has several sidings and spurs as well as a depot and small yard. 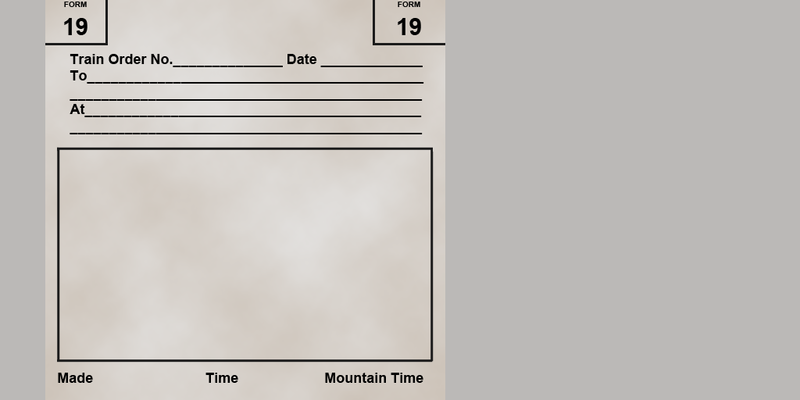 If you are creating your own scenarios you can download a template for a blank train order at the following link by clicking here.